I’ve picked my top 20 mains to ensure that your holiday festivities are delicious and plant-based. I find entrées to be the most difficult things to “vegan-ize” when entertaining a mixed crowd, but you can never go wrong with comfort food! Think pasta, pot pies, and risotto. Mmmm, yeah. If you try any of these recipes in the coming week, let us know! Be sure to tag all of your holiday gathering photos #minimalistbaker on Instagram so we can see. Onto the eats! See you back soon for our desserts round-up! I made #13 minus the tomatoes. I added 3 more garlic cloves cooking them 1st and set aside. I then cooked 3 cups sliced mushrooms. Then added 3/4 cup sliced red onion instead of stallions (didn’t have any) and cooked till done. When making the sauce I warmed 2 1/2 c almond milk unsweetened and added 3 tbsp nutritional yeast and flour for more protein (my daughter is a dancer and needs the extra). I cooked 3 cups of broccoli and served on the side. Everyone loved it including me and I am hard to please. Happy New Year!! I recently got your everyday cooking cook book which I love!! Just a quick question, when your recipes call for almond milk can coconut milk be used? I can’t wait to work my way thru your entire cookbook. Hi Dana! 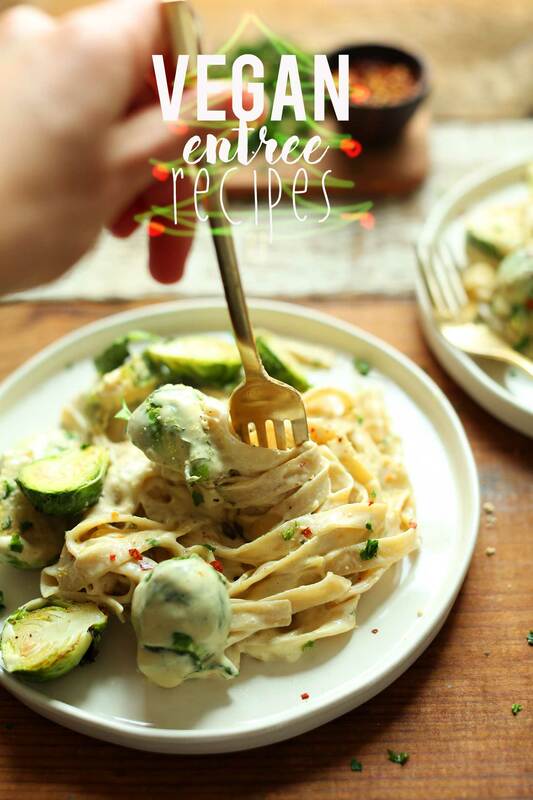 I love your post, these dishes look absolutely amazing and I cannot wait to try some of them! Especially the potpie, such a classic dish with a vegan flare. However, I was just wondering when one is trying to live an authentic vegan diet and while cooking how can you be sure that you are using authentic products, sometimes labels often include unfamiliar ingredients that may or may not be derived from animals, how do you steer clear of that while cooking? I am looking forward to trying these dishes out and further exploring the vegan lifestyle. James, great question! This just requires a lot of due diligence in research vegan friendly products, and when in doubt, asking a store associate (or the seller) if the product is vegan friendly. Try not to stress being perfect and just do the best you can! Thank you so much for your incredible recipes I have been making something from here daily for the past few weeks. Never disappointed, in face obsessed. I might just make that sprouts pasta for dinner! Have a great Christmas! Natalie, I made that, and it is lick the pot clean delicious! ? Enjoy, and peace in the season.